Amerigo Provenzano in arte ''Provenzano dj'' è un dj, un produttore e un radiofonico da oltre 20 anni. Attualmente conduce un programma giornaliero 'Provenzano dj show' nell'emittente italiana m2o. Amerigo Provenzano was born in Rome in 1970 where he spent his childhood growing up with a deep felt passion for the evolution of technology, a passion that compelled him towards the very first computers that were made available to the general public. Since then this passion has continued and it has marked out a path for him to follow that has changed his life forever. At the experimental age of 15 Amerigo’s love of music and deejaying compelled him to dismantle his family’s record player in an effort to adjust its pitch control, this was soon followed by the construction of his very first mixer. With this homemade equipment at hand he could now finally take his fist steps as a DJ. This early period was characterized by numerous pilgrimages to specialized music shops, home parties and mix-tapes that he used to sell on to his friends who were also slowly becoming his fan-base. During these years he often tuned in to a radio program hosted by a DJ that made him understand and realize that this was in fact the distinct path of which he should pursue. Then in 1990 Amerigo’s dream began to take form when he found a job at a radio station (and not just any radio station, the most noted one in the center of Italy), RDS, Radio Dimensione Suono. Whilst working on this national radio station Amerigo began to pick up and learn the various communication dynamics that go with such a job, specifically how to make your music reach a large audience whilst catering for their various musical preferences; this experience played a vital role on his professional development, impacting on his performance side as well as his production skills. Whilst at RDS Amerigo brought a wealth of ideas to the table including that of his passion for IT which revolutionized the stations post-production by introducing the hard disc recording system, something still unheard of in those days where the station was used to running things on their old reel based system. With a continual growth in popularity he began to tour all over Italy where he played his ‘Dimensione Dance’ program as well as his ‘Top Ten Dance’ chart (the latter being developed in partnership with Paolo Bolognesi) and in 1995 he was awarded the prestigious Telegatto for ‘The Best Music Chart In Italy’. His work gained him a high level of popularity and demand, something that can be seen through his development of the Top Selling compilation series ‘Hit Mania Dance’ which earned him two Golden and one Platinum Discs. This was an incredible and unique opportunity which led to the development of ‘m2o Musica Allo Stato Puro’ (m2o Pure Music) which in just a few years became a phenomenal success becoming THE reference point for all Italian true music lovers and a springboard for all the latest electronic related recording trends. As usual Amerigo’s passion for IT continued and he constantly challenged himself for further developments, it was through his IT related musical ideas that he began to produce a new daily program (from 3pm to 5pm) that featured his exclusive and unique mixing method providing the very best in musical production. Later there was also the development of the first official radio compilation ‘m2o Compilation’ which soon became the stations primary marketing tool resulting in great success both in terms of business development and trademark as well as record sales themselves becoming one of the most sold compilations throughout the Italian territory winning four Golden Discs. With an ever persistent eye and awareness on new technologies Amerigo developed the first dual disk supported video mixed compilation in Italy, ‘m2o The Dance Night’ that also became a two-hour television program on All Music TV and further developed into an additional three dual disk named ‘m2all Shock’. In 2007 Amerigo Provenzano developed the very first live m2o broadcast called ‘Out Of Mind’ that featured international DJ’s such as Axwell, Angello, Ingrosso, Fedde Le Grand and Cerrone. During this period numerous productions were launched under his own name as well as under various pseudonyms. 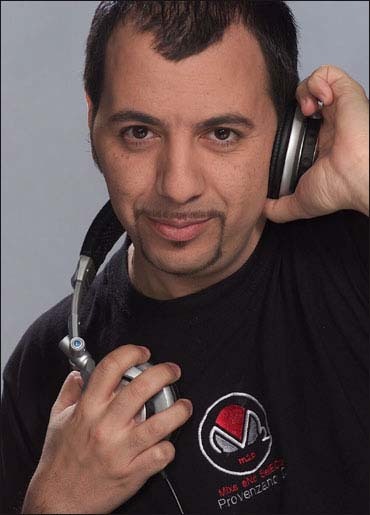 Then in 2009 he revolutionized his radio program by changing his name as well as its time slot (from 3-5pm to 4-6pm) becoming the ‘Provenzano DJ Show’ involving a rapper (D. Borri), a singer (Lizzy B) and a dubber (Gaia Bolognesi) that resulted in a crossover between electronic music, hip hop, melody and words. The program also featured special guest stars and international DJ’s like Judge Jules, Laidback Luke, Joachim Garraud and DJ Antoine. The new program drove hard and succeeded in becoming the m2o stations top program in terms of viewing figures and awareness. In Provenzano DJ’s live performances you can find the elements that have characterized his very own professional development, technological innovation and research in fact made him one of the very first Italians to use Ableton Live during his DJ sets, something that enables him to physically play whilst at the same time interacting with the software creating live mash-ups that render each and every set different from the last. In 2009, in partnership with his close friends who are also DJ/producers Ranucci&Pelusi, he released important remixes for international names such as Fedde Le Grand – ‘Scared Of Me’, Axwell, Ingrosso, Angello & Laidback Luke – ‘Leave The World Behind’, Greg Cerrone – ‘Taking Control Of You’ and Bingo Players – ‘I Will Follow’. Along with Ranucci&Pelusi he also developed ‘We Love Music’ that is a one night show where all three professionals play together resulting in some very unique performances. Whether live or on the radio, Amerigo Provenzano has that special ability of captivating and involving the public, sharing his musical world that is characterized by energy and style. In 2010, under the Reder8 pseudonym, Provenzano released the track entitled ‘Amazing’ that instantly became a big club hit and got some full on support from the Swedish House Mafia, Steve Angello, Chuckie, Laidback Luke, Tiesto and Erik Morillo just to name a few. Then during the Summer of 2011 we saw The Fabulous with Mariguana Cha Cha Cha’ that was put on heavy rotation by all the big Italian networks as well as a hit in the clubs. The track also became the soundtrack to the television advert of the m2o compilation. This brings us to 2012 where we witness a very interesting new path in the route that Provenzano DJ is travelling; first off there is the close collaboration with the Henry John Morgan team with who he realizes the track ‘Turn You On’ Feat. The Audio Dogs as well as the brand new single ‘Touch The Sky’ with the amazing vocals by Amanda Wilson and remixes care of Federico Scavo and Paris & Simo. Another important collaboration comes in the shape of Jaypress UK Management who are currently looking after foreign press, promotions, foreign club interaction and much more for Provenzano DJ. With his recent participation at the SoundRome Festival alongside international artists like Tiesto, Sebastian Ingrosso, Max Vangeli, Congorock, Nicky Romero and others – Provenzano is holding no punches.